How We Discovered This Book: This is another fiction book based on a real person’s story. You can read my previous review for a book of the same type, called Building Our House. 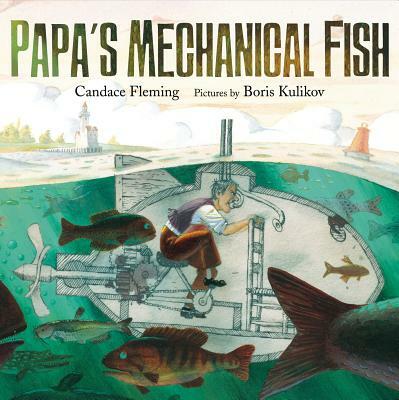 Papa loves to invent things and solve problems, so one day when his daughter asks, “What would it be like to be a fish?” he goes into his work shop and doesn’t come out until he has a prototype. He tests idea after idea, until finally one works. I liked that Papa has not invented anything that works, but he still sticks with it. The story is told in a rhythm similar to a song- there is plot, and then a “refrain.” In the refrain, each family member comments on the events. The manner in which each person talks tells us so much about each character. In most cases, it is the only way we find out what the characters are like. They liked Papa’s creativity, and that his family was so willing to support him even when his solutions seemed silly. Similarly to Building Our House, there is a page in the back that describes the real man that inspired the story- my kids love this kind of real life reference. An inventor named Lodner Phillips created his own submarine in 1951, which made significant improvements on existing submarine designs including steering, an air purifying system, and a boiler than generated steam underwater to run the engine. His family actually went out into Lake Michigan with him in his invention. As suggested on Celeste Reads, you could have children brainstorm their interests, talents, passions, or hobbies in a journal. They can then set a realistic goal (with help), set a timeline, and when the time has passed you can have a presentation day to see what they did and what they learned. Sit down with some art supplies and paper, and brainstorm some things you’d like to see be invented. And then draw as many as you can!